The famous twelve Aurangabad caves are rock-cut Buddhist shrines located on a hill and are divided into three different groups based on their location. The Caves I to V (1-5) are called the "Western Group", the Caves VI to IX (6 - 9 ) are called "Eastern Group", and the Caves X to XII (10-12) are called "Northern Cluster". 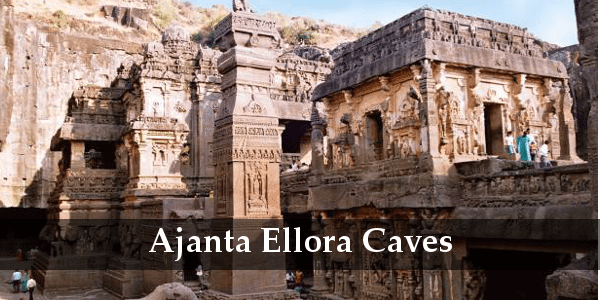 The Ellora Caves are one of the larget rock-cut monastery-temple caves in the world. These caves are famous for Buddhist, Hindu and Jain monuments, and artwork. There are over 100 caves out of which 34 caves are open to public that consist of 12 Buddhist caves, 17 Hindu caves and 5 Jain caves. It is really fun and exciting to explore more at this place. We at KP Travels provide the best tour services with affordable tour packages from Pune to Aurangabad - Ellora - Ajanta such as Aurangabad tour packages from Pune,Pune to Ajanta Ellora tour package,Ajanta Ellora trip from Pune. The distance from Pune to Aurangabad is 236 kms. and can be covered by road in 4 hours. Aurangabad is only 100 km from Ajanta and 30 km from Ellora. Make your journey fruitful and exciting by booking your cab at KP Travels at extremely reasonable price. Book Pune to Aurangabad-Ajanta-Ellora tour package with KP Travels.